I went to London recently as a pit stop on my way to Belgium, not because it’s halfway down, but because there’s a stretch of sea I have to cross to get to mainland Europe and the capital’s got a famous train line that does just that. The last time I went we stopped at the Natural History Museum, and I did it again this time, albeit lining up to see the dinosaurs very early in the morning rather than going at three and hoping for the best. 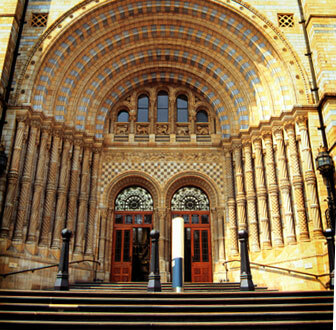 You can learn a lot just from minutes in the museum, but even without the fossils, London’s Natural History Museum is one of the most awesome places in the world. Let me tell you why. 1. Let’s start with the obvious. There are awesome fossils everywhere in this place. From the moment you walk in you’re confronted by a Diplodocus skeleton. In the dinosaur exhibit there’s Triceratops, Baryonyx, Iguanodon and the mind-blowingly large skulls of hadrosaurs like Parasaurolophus and Pachycephalosaurus. If this sounds like a lot of nonsensical words to you, look these things up, I swear they’re cooler than a penguin in a meat freezer. Within the dinosaur section itself you can learn a lot about their history and lifestyles. 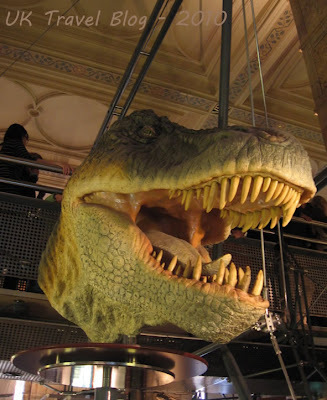 There’s some preserved skin and even an animatronic Tyrannosaurus rex. Now if that’s not something to get excited about I don’t know what is, and I haven’t even mentioned the marine reptiles and the giant land sloth yet. 2. There’s a lot to learn about evolution, mostly mammalian, I grant you, but when you see the whales hanging from the ceiling it’s hard not to be impressed. You can learn about the evolution of humans and other primates, take a look at different ungulates, and even gape at the statue of Charles Darwin in the main hall. 3. It’s not just biology. There are space-themed and human psychology-themed sections of the musem too, each offering really interesting insights into the way things work, whether they be ourselves or the vastness of the universe. 4. The newest section (the cocoon) offers a deeper insight into the world of invertebrates and the role of working scientists in discovering more about them. As well as showing the developments achieved over the years, it offers visitors the chance to do some basic research of their own through comparative anatomy, and if you really liked a part of the cocoon you can scan it on a card and bring it home to look at later (my girlfriend did this with the bees section). 5. There’s some awesome research being done in the museum. The NHM is home to many working scientists actively doing research on life and its history, and thanks to their masters degree and Ph.D programs those who qualify and are as excited about discovering more can learn and train in the museum itself. It gives me goosebumps just thinking about it. For an example of the work they do, scientists in the museum very recently, through analysis of fossilized skulls, determined that some ancient crocodylians ate in the same way that killer whales do, with highly specialized marine crocodile-like creatures diversifying to eat a whole variety of different things, while their land-dwelling cousins did the same on the ground, gaining a more familiar mammalian diet. Okay, now I’ve gushed, the museum needs people’s help. The central hall needs renovating and they’re asking for donations from the public to help fix it up. the ‘I Love Dippy’ campaign (which uses the iconic Diplodocus skeleton as its mascot) needs to raise £8.5 million to raise enough to breathe new life into the museum and get more of their iconic exhibits on show. And as if that’s not enough, you can watch a video of David Attenborough pleading with you to donate to it online. Go to the museum if you ever get a chance, show your support and let your jaw drop.